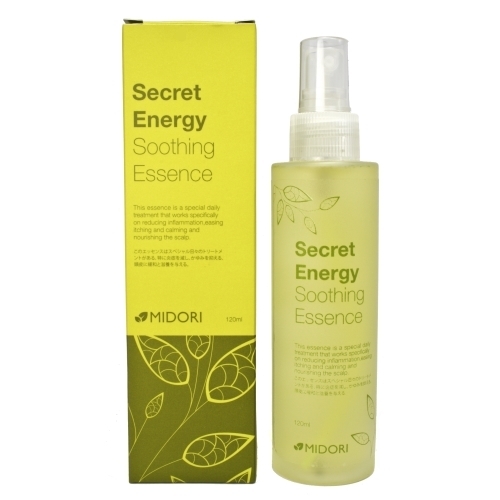 MIDORI SECRET ENERGY SOOTHING ESSENCE 120ML – HAIRDEPOT - Hair & Scalp Care Products, Prevent Hair Loss, Shampoo, Conditioner, Treatment, Styling, Appliances and more! Apply to shampooed and towel dried hair or fully dried hair. Spray lotion directly onto scalp. Gently massage in with the fingertips, rub in with a light circular massage for optimum absorption. Leave on for a 3-5 minutes and styles as usual. DO NOT RINSE.